L2 Productions specializes in turnkey, live, multi-cam HD production and television and internet broadcasting for sports, music and corporate events. With multiple production systems and teams located in several regions, L2 handles events throughout the United States. Our stellar team has produced hundreds of award winning live events for sports clients such as The American Athletic Conference, The Mid Eastern Athletic Conference, The Longhorn Network, ESPN, CBS Sports, USL Soccer, Major League Rugby, West Coast Conference, The Southland Conference, music clients such as Widespread Panic, Austin Music Hall, Duncan Shiek, Austin 360 Amphitheater and numerous corporate clients such as Whole Foods, Dell Computer and Blue Cross Blue Shield. L2's cutting edge approach includes the use of the very latest digital production and transmission technology, very scalable and repeatable processes along with a team of the United States' most experienced and talented team of multi-tasking production professionals. The result is that L2 is has created a completely new paradigm for live production and transmission, delivering very high quality live broadcasts at a fraction of traditional budgets. Sports Video Group (SVG) is a global leader in supporting the audio and video production and distribution industry. Their publications and content are among the most widely read and respected in the industry. Today, L2 Productions was featured in a globally released article focused on the REMI, @Home production model. It may be plain to say, but everyone is obsessed with live sports. OTT and live sports streaming is rapidly taking over viewer’s hearth share, it’s expected to get bigger and better than ever. With the introduction of VR, top quality subscription services and more, it’s plain to see just how immersive the user experience has become – and it seems that as further developments take place, we are going to see a shift towards live online sports instead of traditional TV in terms of viewer preference. One striking insight comes from recent research from The Diffusion Group, which concludes that those most likely to downgrade their current pay-TV service within the next six months are much more dependent than others on OTT streaming services, with around 29% off their time dedicated to enjoying their entertainment through streaming services. 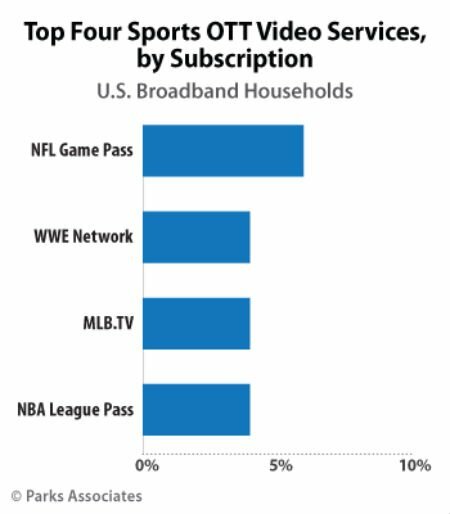 Although this doesn’t seem to be an immediate threat to more traditional pay-TV services right now, these statistics really do serve to show just how prominent online streaming is becoming, and live sports are no exception. A recent study carried out by Parks Associates has shown that 16% of US broadband households subscribe to an OTT sports service – an impressive figure considering how niche the sports market can be. When streaming options for live sports are been analyzed, football (European) is clearly most fragmented. Not so long ago, football fans in the U.S. struggled to follow their favorite leagues and teams, even if they had subscription to cable. The context is changed nowadays, with services like fuboTV, YipTV, MobiTV etc, there are more legal ways to watch their “soccer” online, even more than the rest of the mainstream sports. In short, it seems that big things are going to happen in the sports streaming market this year and beyond. Recently, Amazon announced that they have recruited veteran sports media executive James DeLorenzo to head its newly formed sports group, following their bid to monopolise NFL’s Thursday night football game (which was snatched up by Twitter). It looks like Amazon is placing a huge amount of focus on sports programming for its streaming service in a bid to gain a competitive edge on the likes of Netflix and Hulu. That said, Hulu is reportedly launching a live streaming service, which will give their customers access to several television networks such as ESPN and Fox news – news that has been welcomed with open arms among sports fans and the live streaming community. There is no doubt that live sports streaming is hot right now, and it’s only going to get hotter. As more and more OTT providers compete to win the loyalty of sports fans and dangle the proverbial carrot under their noses, there are going to be more and more exciting developments, services and events at each of our fingertips. Whether you’re a content provider, a consumer of both, there has never been a more exciting time for live sports streaming. Should You Broadcast Your Next Corporate Event on the Internet? Is my corporate event worth streaming? One of the first questions you'll want to consider is the relevancy of the event and whether or not it is suited for live streaming in the first place. Do you have a keynote speaker or main presentation that you want to focus on? Will your targeted audience gain something from the broadcast of your event? Not every corporate event has the setup or content that requires an internet stream, so it's worth considering the medium and type of corporate event. How much can you invest in the event? With the advent of live stream apps like Periscope, it isn't expensive to broadcast your live event. However, you'll want to consider the quality of your broadcast as a Periscope live feed isn't going to look very good. If you hire a production company that specializes in live internet broadcasting and has experience with corporate video production, the quality of your stream will obviously be much better. If you can budget it, a highly regarded production company with advanced technologies could be a worthwhile investment. Who is your targeted audience? A final question worth asking is who will be watching your event to begin with? Is your targeted audience good with technology? Do you have confidence that your online guests will know how to access your event? Consider your audience to see if the internet is the right medium to broadcast your event. We're a more digital world than ever before. Live streaming is just another way to be anywhere right from the comfort of your home. However, live streaming isn't always the best solution. Therefore, it's important to consider your event and audience before you decide to make the investment. In addition to that, as live streams are a highly technical endeavor, you should try to find a production company with proven experience in internet broadcasting. L2 provides a turnkey solution for live production from script to screen including pre-production planning and scripting, graphics development, multiple HD cameras, live switch, instant replay, live graphics, announcer talent, lighting and all equipment and crew necessary. From its state of the art multi-track audio recoding studio and film studio facility in Austin, TX, L2 can pre-produce any an all assets required for your live event including commericals, PSAs, graphics packages, special features, etc. L2 provides a turnkey service for live internet broadcast. Leveraging cellular bonding technology through an exclusive partnership with LiveU, along with a sophisticated managed and monitored back end load balancing, transcoding and distribution system, L2 provides the highest quality, most reliable live streaming service available today. ESPN SportsCenter from L2 Productions on Vimeo. American Athletic Conference Temple Vs SMU from L2 Productions on Vimeo. Next Waltz Trailer v1 from L2 Productions on Vimeo. L2 leverages the most cutting edge technology available today in its multiple live production rigs which are physically dispersed throughout the United States. Using the very latest cameras, replay systems, switching technology, scorebug/graphics systems and audio gear, L2 is prepared to deliver on live productions of any size and scope. From it's state of the art multi-track recording and film studios in Austin, TX, L2 delivers exciting and impactful studio produced content ranging from custom audio and music to full video production from script to screen.